Judy Tuesday here with another plate from Volume 25, which ran from July to December in 1879. These two particular outfits were featured in the month of August and include (as previously promised) a funny bird head hat. Given that it’s a bathing costume, it almost makes sense since it could be a tightly-fit cap that’s almost sort of aerodynamic for swimming. No? 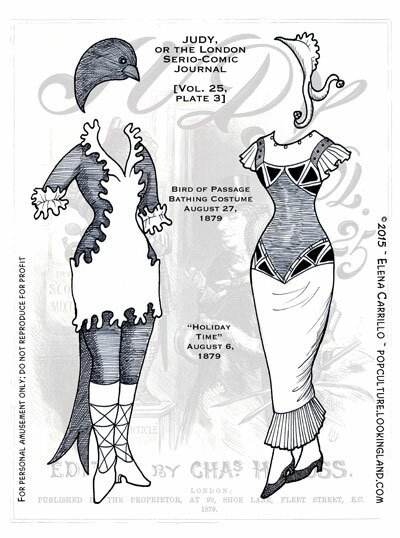 The Holiday Time costume was something fun that was in the margins (not part of Chasemore’s actual “series”), but this volume was low on costumes I wanted to reproduce, so I teased this one out for inclusion. I guess I should mention, in case it’s not obvious: I am picking and choosing which costumes I’m drawing out of many. In these early volumes there aren’t as many good choices so I’m only filling about 5 plates. In the 1880s there are a lot more to choose from as Chasemore got more fanciful with his designs. In the meantime, enjoy this weird bird thing and the holiday costume with the jingle bells. To find all the plates in this series (and the dolls themselves) click on the Judy tag down below.